This collection of adversaries clocks in at 16 pages, 1 page front cover, 1 page editorial, 1 page introduction, 1 page SRD, leaving us with 11 pages of content, so let’s take a look! A brief history lesson first: This book is the result of an open contest to design adversaries for the PCs. Each of the foes comes with a statblock, a brief history as well as suggested goals and plots, making the respective villain come alive. Sergeant Maybn Blaine would be the first character herein, and the powerful female urban ranger actually has a cool modification: Her favored enemy would be half-bloods! This makes sense and for an adversary your players will love to despise! Ayenna Gilfen, a half-elven arcanist would be up next and she is a poor soul: Her soulmate, Nessa Highmoon died and, grief-stricken, she has freed a very unpleasant ghost from his forbidden tome…who has since convinced her to murder on his behalf, all to regain her lost love. Fester Grizzlestix would be a shaman that is less tragic: The self-appointed fungus lord lords oer leshy and is just as nasty as you’d expect him to be. More interesting from a build-perspective would be Hadin the Painless, an unchained monk/ninja multiclass with grand plans of creating his own dominion. His build is pretty nice, The middle-ages animal speaker Friedrich Wildheart is a nice twist on the trope of the “hermit kills anyone who ventures into the forest” -after all, you’d expect a druid…only to meet a bard! Wolton “Wolly” Venuti is a gnomish sorceror and a charismatic one at that; seemingly an idiot, he is a dangerous individual nonetheless – his tawdry robes concealing ambitions to create a deadly army of constructs….but whether due to being basically an imbecile or due to true darkness in his heart – that’s up for the GM to decide. Heffreck Threecasks would be an unconventional druidess – in fact, you’d consider her a highborn lady who has grown wealthy via the unique vintages she offers. Have I mentioned that her vintages are made from assassin vine-stock and thus…well…require nourishment? Theme-wise certainly the coolest here. Brynnhildr Sigurinn (should be -in, if you adhere to quasi-Norse nomenclature for females, but that only as an aside) is a fighter/musket master multiclass, which would be interesting. Unfortunately, however, her statblock lacks a ranged-line, which is annoying considering her musket expertise. 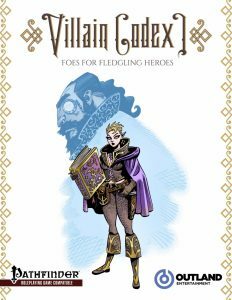 Voska Freehand would be a daring infiltrator swashbuckler; the halfling has shed her erstwhile slave-status and turned outlaw, but her fear of becoming penniless still remains. Jenrak, Master of Serpents would be a cool unchained summoner whose eidolon takes the form of a nasty serpent, making him a perfect foe when used in conjunction with quasi-Egyptian lands like Osirion or as an unconventional high-priest. Salduin the Black Wolf is a magus/inspired blade swashbuckler multiclass and seeks to unite several barbaric clans to take the civilized lands. Editing and formatting are generally very good on a formal level, though the missing ranged-line is a pretty nasty hiccup. Layout adheres to a nice, printer-friendly two-column standard and the pdf comes with neat b/w-artworks for each of the villains (big plus!). The pdf comes fully bookmarked for your convenience. Authors Andres Bermudez, Matthew Browett, Nik Geier, Scott Janke, Mikko Kallio, Luis Loza, J.T. MCroberts, Jacob W. Michaels, Michael Riter, Andrew Umphrey, Christopher Wasko, with development by Mikko Kalio and Jacob W. Michaels, have provided some nice and creative builds and characters – if one of the villains is not 100% brilliant in the build, it does feature some cool and unique angles for the respective adversary. The characters herein are generally creative in concept, with a certain vintner-druidess being my favorite in concepts. That being said, build-wise, I wasn’t absolutely blown away by the villains presented herein -they are good and creative, but do not reach the level that would have blown jaded ole’ me away. Hence, my final verdict will clock in at 4.5 stars, rounded down to 4 for the purpose of this platform. You can get this cool collection of NPCs here on OBS! Cool, btw. : There is a neat contest for monster design running right now! So if you want to take a look (and have a chance of getting published), take a look here!